Our hearts reach out to the people of Haiti who are trying to pick up the pieces in the aftermath of this week’s horrific earthquake. The country still has an incredibly long road ahead of them – first, in rescuing survivors and then providing them with safe, healthy and environmentally friendly shelters. Since Hurricane Katrina, a number of individuals and companies have worked to develop new and improved emergency relief structures. Read on to see the ones that we hope can be put to use in Haiti. These shelters, designed by Michael Daniel, are designed to be quickly deployed and (because they are flat packed) many can be shipped to the disaster area at one time. Easily assembled in minutes without any tools or machinery, the Reaction Housing unit can house up to 4 people and is wired for utilities. 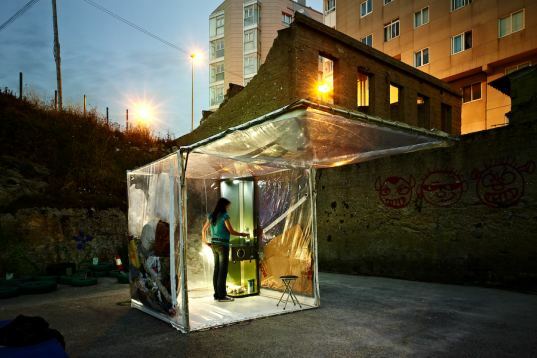 This shelter is made out of a lightweight plastic skin that is put on over an aluminum frame. Clothing, fabrics, grass or other materials can be inserted into the skin to create insulation, and it also includes hookups for water and utilities. Minimalist in design, this prototype has a lot of potential to be easily manufactured and deployed. 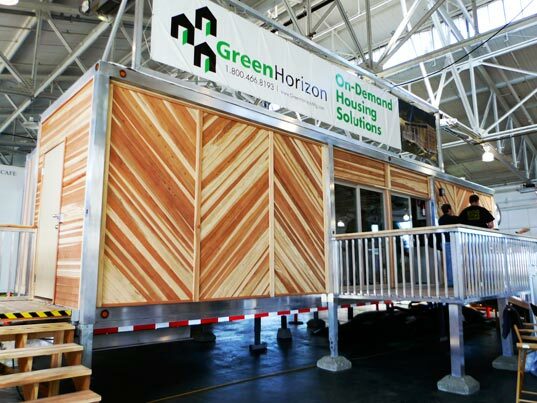 Beefier than the first two shelters, the Green Horizon Prefab is also environmentally friendly, made from recycled materials, outfitted with solar panels, greywater recycling, wired for utilities and made of prefabricated parts. The prefab can be easily shipped by attaching wheels to the bottom and carting via truck, or it can be placed in a shipping container. Manufacturing for the Green Horizon has already begun, but no word if they are far enough along to be utilized. A simple yet elegant design, the Folding Bamboo House, designed by Ming Tang, is constructed from bamboo and recycled paper and can be cheaply manufactured. 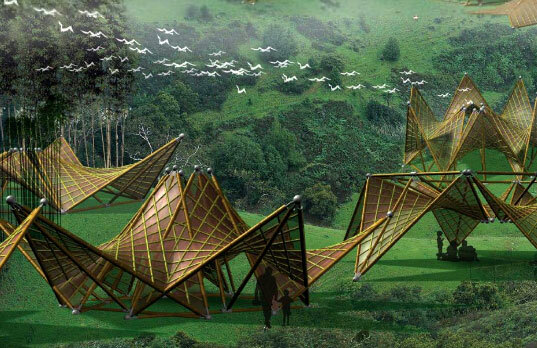 Tang designed the geometric folding structure after a7.9 earthquake hit central China. 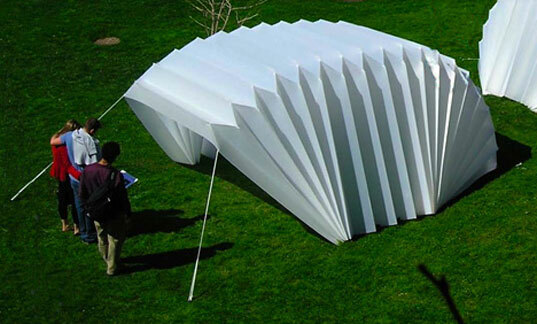 The structures can be folded into many different shapes, allowing a range of structures to be created. This first response emergency shelter is super easy to transport and set up requires only one person. Made out of polypropylene, the shelter can form many shapes and provide relief for up to 4 people, while rainwater can be collected from the folds. While it doesn’t include a utility hookup, beds or renewable energy generation, it does provide a quick roof over disaster victims heads. Conceived by Shelter Architecture in collaboration with Architecture for Humanity, this completely off-grid prefab unit, can provide water, sanitation and renewable generated power. 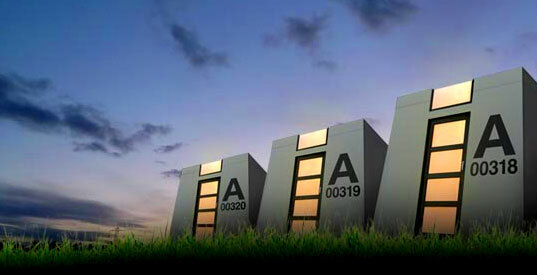 It’s designed to support victims after a disaster as a mid-term shelter, rather than as a first response. 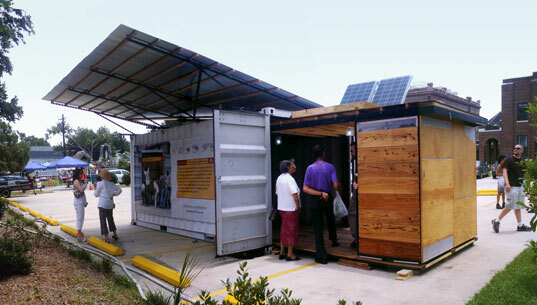 Built within a standard shipping container, the unit is self-contained and can be shipped within days. While we don’t know yet what kind of emergency shelters are being deployed to aid the people of Haiti, we hope that relief organizations are much better prepared than in previous situations and can offer Haiti the help they need. If you want to show your support, please consider donating to a worthy organization like the American Red Cross International Response Fund, Doctors Without Borders, Architecture For Humanity, and more. Four Day Project \\\\\\\"A Huge Success.\\\\\\\" http://www.earthship.com/haiti Thanks to everyone who helped provide information, connections, advice and donations for the Earthship Biotecture recon visit to Haiti. As it turned out it was much more than a recon visit... we built a building with the help of forty Haitians from the tent camps - ages four to fifty. Sometimes there is enough construction material in disaster areas to build upon. I teach people how to make very cute, livable yurts out of scraps and recycled materials. My family lives in them year round in South Central Alaksa. They're comfortable, adaptable to any climate, stand up to strong wnds, stay warm and cool both, and have been proven sustainable on the Mongolian Steppes for over 3000 years. "Gertee: Houses made from scraps" was just posted at my blog, http://www.nikiraapana.blogspot.com There may be places where people in emergencies already have access to what they need to build their own gertees. For manufacturers, flat boards, tarps and ropes ship easily enough, and there are options and alternatives to traditional roof rings too. A new basic frame and one layer of coverings, 16' wide, 10' high center, 5 1/2' walls can be made for under $200USD in Alaska. It takes about 45- 2x4s, 300' rope, 400 ties, one 20x20' tarp, and 5- 5x8' tarps. The roof ring is the only piece that needs to be developed more. There is a guy in Talkeetna who's working on a center roof piece that can be mailed via USPS. We're working on a PVC ring design, but presently everyone who builds these has to come up with their own version. Several of the commentors at my gertee instructable used bamboo for their gertee frames, so I totally agree with bambiat that it is an underutilized, natural and plentiful resource with a variety of sensible applications. Does anyone know if ther is a comprehensive catalog available to relief agencies with all the possible housing options? There are so many good ideas and so many as yet undiscovered ways to make ourselves at home. It would be wondeful to offer all the newest ideas to the homeless and see what happens organically. Yes, I also think that most of these do not appear highly practical for a quick and easy drop off and assembly. Althouth out of the ones above bubble house seems like it might have the eaisest short term housing potential at this point. Defnitely check out www.bambitat.com. I did and I think the design sketches and ideas has huge potential particularly for this type of disaster and sort of emergency housing sitution. Also, that design really has the potential to not only be an emergency shelter but can be utilized as an actual home... long term rebuilding. Haiti and other area not only need great emergency shelters but long term rebuiding of homes.. this could fit the need for both and it's sustainable. I applaud any action that is taken in regards to thinking of future housing with these kind of disasters. The innovation that springs from times like these can do nothing but increase the breadth of our work as designers and practitoners. One thing to keep in mind is security and maintenance. I am sure there are many desperate people on the ground and their security has got to be paramount. Long term stability of these structures would also be very helpful. Good for all of the innovative thoughts. The future is brighter due to designers products like what I have seen here. As is, shipping containers are not fitted for human occupancy. But emergency interiors designed to be placed within shipping containers could create shelters for quite large numbers of people. Shipping containers are the piggyback containers or can-tainers, the kind that are loaded into ships and onto rail or truck beds. They are often available in large numbers near major human population centers. An emergency shelter interior LINER-SHELTER, designed to fit into the shipping container, could bridge the gap between the steel outer shell, which is strong and provides durable protection against the elements, and the human safety, comfort and dignity requirements within. The liner-shelter could have relatively thin plastic sheet along the walls, a somewhat thicker sheet on the floor. The ceiling would require careful design to protect against rainwater that could collect in a mere plastic sheet. It could have a drain pipe from its center, sloping down to the side, to intercept rainwater entering through the shipping container roof. Kitchen and bath utility would require special, more complicated planning. The whole interior liner-shelter should be carefully designed to be inexpensive, easily transportable, of abundant materials and all the rest. I find it interesting you didn't mention ShelterBox, which is one of the more successful agencies with regards to on the ground deployments.